Following Perestroika, vast fortunes were made from the rapid privatisation of Russian state assets by sharp entrepreneurs. When Vladimir Putin came to power and wanted to recover these funds, many of the new billionaires fled to the West, and in particular to London, where generous tax breaks and a reluctance to extradite the oligarchs to their homeland offered a comfortable sanctuary. 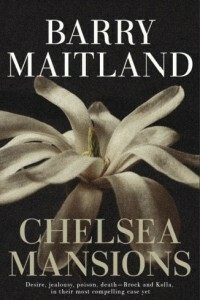 This is the background to DCI Brock and DI Kolla’s latest investigation, in which the multi-millionaire Mikhail Moszynski, with his new Caribbean model wife Shaka and a colourful Russian entourage, has created a glitzy palace in Chelsea Mansions, a grand Victorian residential block in one of London’s golden postcodes, to the discomfort of the locals. Chelsea Mansions draws the Scotland Yard detectives Brock and Kolla into a new clash with an old and wily enemy, the corrupt politician Sir Nigel Featherstone Hadden-Vane, who is nurturing Moszynski’s ambitions for a British knighthood. It also confronts David Brock with his own very personal history and Kathy Kolla with a challenge to her professional integrity, which sends her to the USA, to investigate Moszynski’s KGB past.